Audet & Partners, LLP is investigating claims by consumers that manufacturers of CREE light bulbs provided false and/or misleading information about the expected life span of the bulbs in advertising and on CREE light bulb packaging. Consumers are alleging that CREE overstated the life span of their LED bulbs relative to conventional, incandescent light bulbs. In so doing, the company may have exacted a higher purchase price from consumers who otherwise may well have opted for cheaper conventional bulbs. Though in recent years manufacturers have refined their predictions about LED light bulb lifespan expectancy, and the cost of LED bulbs has fallen, consumers may now be finding that LED bulbs sold several years ago are burning out and failing well before the manufacturer had predicted on the LED bulb packaging or associated advertising. 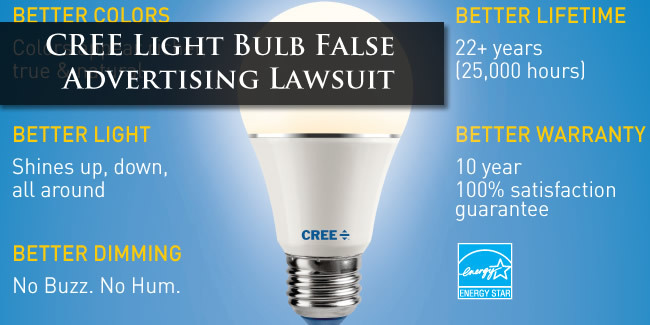 If you purchased CREE light bulbs in the past and have now discovered that their life span was significantly shorter than the manufacturer had represented prior to your purchase, you are urged to contact a consumer fraud attorney with Audet & Partners, LLP for a free, confidential case evaluation to determine whether you may have a claim in a CREE light bulb lawsuit. You can reach us either by completing and submitting the inquiry form on the right side of this page, or by giving us a call at (800) 965-1461.